Caratula del volumen cuatro de Ash & Pikachu. 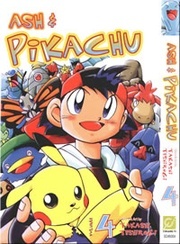 Ash & Pikachu (サトシとピカチュウ Satoshi y Pikachu en japonés) es una serie manga escrita por Takashi Teshirogi y publicada en inglés por Chuang Yi en Singapur. Cuenta con los mismos personajes del anime y se basa en las aventuras de Ash y sus amigos por la región Johto y Hoenn. Salvo el toque humorístico que se les da a los episodios, este manga no presenta diferencias muy notables respecto al anime. Se puede ver al protagonista en su lucha por conseguir medalla de gimnasio, sus encuentros con algunos Pokémon legendarios de Johto y Hoenn, enfrentamientos con villanos como el Team Rocket y el Team Aqua, y finalmente el desafío de la liga Pokémon. El manga Ash & Pikachu se compone de 6 volúmenes. Episodio 1: Hoppip, The Wind Calls! Episodio 3: Treasure Hunting?! Try The Maze! Episodio 6: After The Missing Rucksack!! Episodio 7: Let's Save The Lugia! Episodio 8: Catch The Wobbuffet!! Episodio 10: The Grand Rhydon Plan. Episodio 11: Do Your Best Bulbasaur!! Episodio 13: The Dream Potion Recipe!! Episodio 15: A Mysterious Egg!! Episodio 17: Let's Save Pikachu!! Episodio 18: The Keeper Of The Tree, Treecko!! Episodio 19: Trust In Each Other!! Episodio 20: Brock, A Man Of Resolve!! Episodio 21: The Enchanting Pokémon Soul! Episodio 22: A Pokémon Battle Against An Entire Family?! Episodio 24: A Mysterious Masked Man Appears! Episodio 25: I'll Win With My Own Battle Style!! Episodio 26: Hunt For The Treasure Of The Universe! Episodio 28: Saving Kyogre, The Lord Of The Ocean Depths! Episodio 29: Battle Till The End! Drake, One Of The Elite Four! Episodio 30: The Birth Of The Invincible Team, Max And Ralts!! Episodio 31: A Clash Of Wills!! Eternal Rivals?! Episodio 32: Start Of The Pokémon League!! Episodio 33: Off To The Battle Frontier!! Episodio 34: An Awesome Showdown!! Episodio 36: An Infinite Bond!! Se editó esta página por última vez el 10 may 2018 a las 02:27.